← Paris Open House – Friday June 13-Free Food, Free Fun, and Fiber Optic Cable. 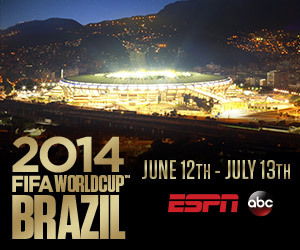 You can watch the 2014 FIFA World Cup™ online on WatchESPN.com with Direct Communications High-Speed Internet. Log on to directcom.com today to get remote access. You can watch the 2014 FIFA World Cup™ online from anywhere in the U.S. on ESPN3 available on WatchESPN with Directcom High-Speed Internet. As long as you are on your home network (that is, on Directcom’s network within Eagle Mountain) and using one of our IP addresses, you will be able to access the games. We have had a couple of customers not being able to access ESPN3 because they were logged into a work VPN while at home, and ESPN3 will only work within our IP range. TO WATCH REMOTELY: In order to watch when you are away from home, you will first need to activate remote access. To do this you will need to set up an ESPN online account while in your home network (ie, using our internet connection or IP addresses) and then activate remote access by clicking on the “Remote Access” button at the top right. That will allow several days of remote access, after which you will need to return to your home network and reactivate remote access again. TIP: The ESPN app on your Xbox is probably the best and easiest way to access the games.